In our house, breakfast during the week usually consists of eggs, oatmeal, cereal, or for me, nuts and cheese. The weekends; however, are reserved for something more time consuming. 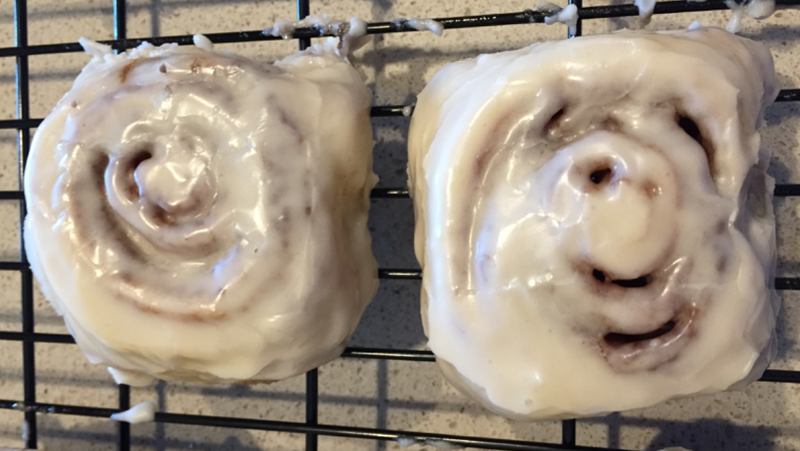 It had been over 15 years since I’d tried my hand at cinnamon rolls, so it was worth another shot. Preheat oven to 400 degrees. Grease a 9×13 pan with butter; set aside. In a bowl or a food processor, combine the flour, sugar, baking powder, and salt. Cut or pulse in butter until crumbly. Stir in milk, a little at a time, and toss with a fork until mixture forms a ball. Turn dough onto lightly floured surface; roll into a 14 inch square. Spread with 3 tbsps. butter. Combine the brown sugar and cinnamon; sprinkle over butter. Roll up the dough and cut into 12 even slices. Place cut side up in a greased pan and bake for 18-20 minutes, or until a light golden brown. Remove from oven and brush tops of rolls with remaining butter. In a small bowl, whisk together the powdered sugar, milk, vanilla extract, and dash of salt. Spread over the cinnamon rolls while still warm. Served warm, these melt in your mouth. To store, allow rolls to get to room temperature and transfer to a Tupperware container. Or freeze individually by covering in plastic wrap.